Frances Rae Van Arsdale, 85, of Louisville, Kentucky, passed away on Sunday, February 10, 2019. 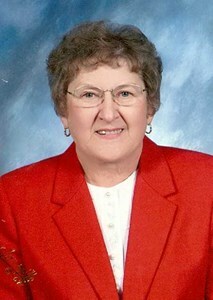 Frances was a member of South Jefferson Christian Church. She was born on February 4, 1934 in Leitchfield, Kentucky to Leo and Edna Birch. She is preceded in death by her Husband, William Stanley Van Arsdale, her parents, and granddaughter, Jessica Cecil..
Frances is survived by her loving Daughters, Vicki Cecil, and Marcia Tomes, Brother, Curtis (Frances) Birch, Sister, Alice Culpepper of Mt Gilead, NC, Grandchildren, Amanda, Wesley, and Jonathan, Great-Grandchildren, Jayden, Alaze', and Kami, and her beloved Beaker. Visitation will be from 4:00 pm to 8:00 pm on Thursday, February 14, 2019 at Newcomer Cremations, Funerals & Receptions - Southwest Louisville Chapel, (10304 Dixie Hwy). A celebration of her life will be at 11:00 am on Friday, at the funeral home with burial to follow at Resthaven Memorial Park in Louisville, Kentucky. Add your memories to the guest book of Frances Van Arsdale. Frances Van Arsdale was one of my mother's dearest and most faithful friends of long standing. It was a great grief to Ma's soul that her health, and to a lesser extent my own, would not permit our attendance at the funeral. For as long as she was able, Frances would faithfully make regular calls to check on Ma's health, even though Ma's inability to hear well, and the impediments to her speech and ability to form and express her thoughts or understand what others tell her (Ma has had Parkinson's for some years) could make conversations a bit of an ordeal for the caller. As I was kissing Ma goodnight on the eve of the funeral, Ma had a touchingly lucid moment and said, When I think of Frances, I remember the story in Acts about Tabitha or Dorcas, who was full of good works and acts of charity, and how all the widows were weeping and showing the clothes and things that she had made for them. Frances was just like that. God bless the family and all her loved ones in this time of grief, especially Marsha, who was caring for her in her final time of life. I know well how hard that can be. I know we are to judge nothing before the time, but if ever there was anyone I know, of whom I can feel confident that she will hear the words, Well done, thou good and faithful servant, Frances is she. I have many happy memories of Frances and her sweet smile and hospitality. Best homemade ice cream in the world! Lots of fun and laughter. A wonderful, caring, Christian lady. God bless my good friend Marcia and all the VanArsdale family. Our family(the family of JoAnne Cornett) remembers Frances with Love and appreciation for our long friendship.Both Frances and Stanley were caring and supportive friends when we lived in Louisville and after we moved to Lexington. What a blessing true friends are! We rejoice that she no longer suffers and is present with the Lord Jesus and with her beloved husband. I have such fond memories of the times Daddy (Scotty VanArsdale) and I drove to see you and Uncle Stanley in Eastview and of the wonderful meals we enjoyed at The Whistle Stop. I don't think I ever properly thanked you for the care and concern you showed in helping look out for Daddy in the last years and months of his life. I so appreciated it. Some recurring health issues are keeping me housebound right now and I will always regret not being able to be present at your visitation and service. But I am with you in spirit and I know that you are rejoicing in reuniting with Uncle Stanley. Much love from your niece. I have a lot of happy memories with Stanley and Frances, whom were our next door neighbors on Dutschke Road in Valley Station, Ky.
Everything from playing bat mitten, horse shoes, canasta, to having biscuits, eggs, sausage, and gravy for Sunday night meals together. Frances and I trimmed a very over grown shrub in front of their bedroom window, which up set Stanley quite a bit until it regrew it's greenery regrew it's shape, and they could see out of their window, then he admitted it really looked better, but that he thought we had killed it. Our children played together, their oldest and our youngest were the same age, then along came Marsha , which we all enjoyed, I remember her Doctor wanted a urine sample so Frances and I took turns holding her over a container,minus her diaper until we got a sample for her Doctor. Hey when you are young and dont have the right equipment, you figure out how to make do. I could go on and on, but just wanted to know what good neighbors, and great friends they were to every one. Thank you also for for encouraging my husband to join you at the beginning of South Jefferson Christian Church, where he was baptized and grew into a christian life. Thank you for being our life time friends. Ms. Frances was a great lady. As a child I grew up next to the Van Arsdale Family. She lived her life the same everyday. Caring for all people, always watching out for the best interest of all the neighborhood kids. I went to bible school as a young child seeing many follow after me. It was truly an honor to have known her. Forever I will remember Ms. Frances. My prayers for the family. We have known Frances for many years. We have worked together at South Jefferson Christian Church and at White Mills Christian Camp. Vickie and Jim were former neighbors to us. May the Lord bless and comfort you during this sad time. Frances was a faithful Christian who is now with Jesus Christ in paradise! We have all lost a very fine Christian lady! Enjoy your reward, Frances! Rest in peace sweet Frances. We have the blessed assurance of your being in heaven gathered around God's throne. We love you! We are so glad you and Stan made your earthly home in White Mills for awhile. You will always be in my memories for when I was a child. Having fun times with you , Uncle Stanley and the girls. Christmas and family gathering will always be there. Even with our boys, they remember the good times that we had at your house in the back yard and dinners that we have and all the good visits when you can to Houston. I can't be there, but you are in my heart and thoughts. Best Aunt and Uncle ever !!!!!!!!!! You will be missed by all those that knew and loved you. You had such a sweet and gentle spirit. Rest in Peace Frances. Prayers for all your family and friends.